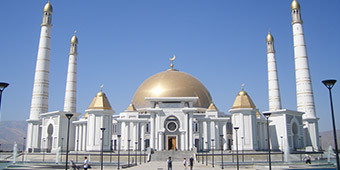 Ashgabat is located in Ahal region, as well as the Kopetdag Mountains and the southern parts of the Karakum Desert. Traveling west takes you to mountain villages, a network of underground lakes and moon-like landscapes, where four-wheel drives are the mode of long-distance transportation, accommodation is in basic homestays or camp style, where (multiple-)day walking tours and birdwatchers visit. Traveling east takes you to sites that reflect the region’s importance during the medieval Silk Road period and human presence as early as the Bronze Age, where archeological teams are active in excavations. Serakhs provides another entry point into Iran. Traveling north takes you straight into the Karakum Desert, which makes it excellent terrain for jeep safaris, but also horse riding treks. 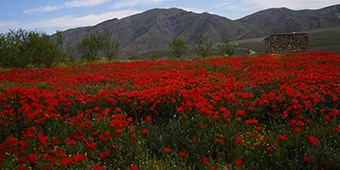 The Tejen River and The Karakum Canal traverse the region and have provided the necessary irrigation for agricultural activity: driving along the foothills of the Kopetdag you will see fields of grain and cotton, vineyards, and fruit and vegetable plantations, as well as processing plants. Just outside Ashgabat to the east, Anau is the site of an urban settlement that existed since the Bronze Ages, but flourished particularly under Parthian and Timurid rule. Next to excavation mounts and the remains of the medieval fortress are the remains of the portal of the magnificent mosque of Said Jemaliddin, constructed in 1456. Although the portal collapsed during the 1948 earthquake, the remains are impressive. It serves as an important local pilgrim destination. 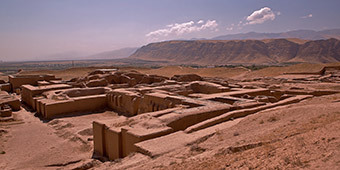 Abiverd is an archeological site showing settlements that existed since II c. BC, but particularly thriving as one of the principal Silk Road cities of Northern Khorasan. Renowned for its moderate climate and abundant bazaars, documented by historians and praised by Parthian, Arab, Persian and Seljuk rulers, alongside Merw, Nissa and Serakhs. 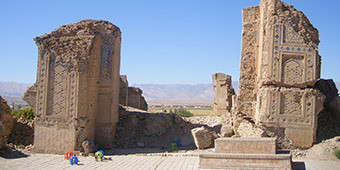 Today, the remains of the city's citadel and shakhristan remain proof of the importance of the city, which halted when local water sources dried up in the XIX c AD. Mehne was a medieval urban Silk Road town that connected Merw with Serakhs. At the outskirts of the town the mausoleum of Abu Said (locally referred to as Meane Baba) is located. Abu Said (967-1049) was a well-known Sufi sheikh, and his mausoleum remains an important pilgrim destination up to the present day. The mausoleum construction belongs to the masterpieces of the Serakhs architectural school (XI-XII cc.). 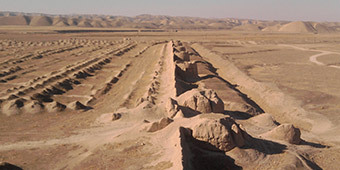 The archeological site of Ulug Depe is unique in that it represents proof of the longest chronological sequence of human habitation ever found on the territory of Central Asia. The 30-m high mount at the foothills of the Kopetdag Mountains revealed evidence of human habitation as far back as the Neolithic era, the Bronze Age and Stone Age. 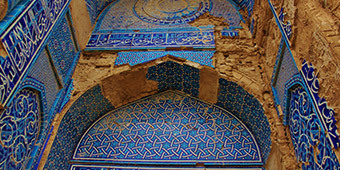 A Turkmen-French archeological expedition conducts excavations, conservation and restoration work. Today at Altyn Depe archeological site a 22m meter high mount, covering a 46ha territory, indicates the presence of a settlement from the Bronze Age (3000-1600 BCE). Remains of a ziggurat were found of which the central building was 12m high and 26x26m in size. Altyn Depe is located not far from Meane (Mehne) and Kaahka town, on the way between Ashgabat and Mary. 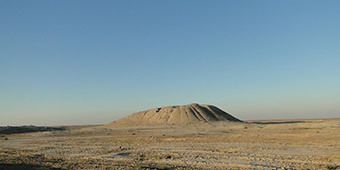 In the same area lies Namazga Depe, where excavations from various time periods functions as reference for the chronology of other Bronze Age sites in Turkmenistan. The most significant is Namazga V (dated 2000-1600 BCE) when Namazga Depe emerges as a center of local production and probable government. Around 1600 BCE, Namazga Depe shrinks to a fraction of its former size after incursion of nomadic pastoralists from the Alekseyevka and/or Srubna culture. 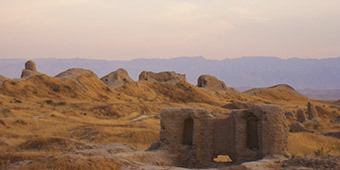 The remains of a large fortress, built on orders of the 18th century Persian governor Nadir Shah, is located against the backdrop of the Kopetdag Mountains. The rectangular construction had walls of one kilometer long and 3 meters high, and 12 circular towers that fortified each wall. The southern walls were damaged by floods; the others however, have survived till date. The ruins of a palace remain visible in the inner part of the fortress. Located on a natural high platform at the foothills of the Kopetdag mountains, Nissa owes its importance to the early Parthian rulers who took over control of the area in III c. BC. Proof of Hellenistic architecture and Zoroastrian worship are clearly visible at the site, while the magnificent collection of ivory rythons found here, can be admired at the National Museum in Ashgabat. Life in Old Nissa ceased by the end of Parthian rule (III c AD), but its shakhristan (New Nissa) continued to exist until the mid-19th century. 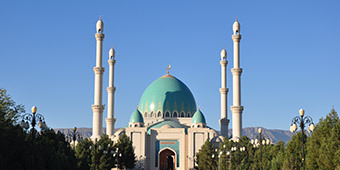 The Ruhy Mosque (literally: spiritual mosque) at Kipchak was built between 2002 and 2004, and is one of the five largest mosques in the world (capacity of 20,000 people). Its outer construction largely made up of white marble, the structure forms a magnificent contrast against the backdrop of the Kopetdag mountains, and the golden cupola can be seen from far away. The mosque architectural details hold numerous Turkmen symbolisms. The next door mausoleum holds the graves of Turkmenistan's first president and his family. Geok Depe (‘Green Hill’) hosts the remains of a 19th-century fortified settlement, where in 1881 a decisive battle between the forces of the Russian tsar and Turkmens of the Teke tribe took place. The site hosts the Saparmurat Haji mosque, a small history museum and the ruins of the fortress. The mosque was constructed in 1995 and topped with a blue dome (Geok Gumbez), and flanked by four tall minarets. It is dedicated to the commemoration of the victims of the battle. Kowata (literally: Father of Caves) is one out of a dozen karst caves in Turkmenistan, created as a result of carbonate accumulation millions of years ago. The waters in the cave's lake holds multiple minerals. 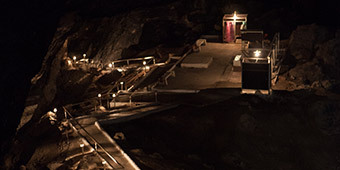 The cave is 65 meters deep, and the lake is on average 10 meters deep, with an average water temperature of 37 degrees year-round. After a swim in the lake you can enjoy tea and shashlyk under the trees next to the cave. 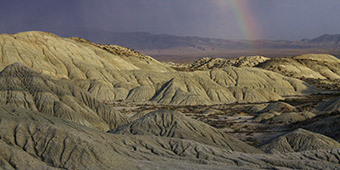 The mountains form a natural border with Iran, hosts some unique protected flora, birds and mammals, and some bizarre lunar-like landscapes. The Sumbar river area runs through the range. The dry and sub-tropical climatic conditions lead to an abundance of wild and cultivated forms of vegetation, such as pomegranate, fig, pistachio and walnut. 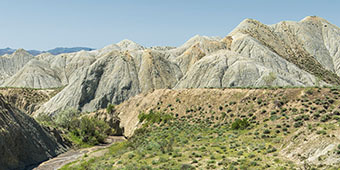 As a result of ancient volcanic activity west of the region, barren lunar-like hills, deprived of any form of vegetation, form a unique contrast to these fertile landscapes. Nohur is home to a small community that lives in the high valleys of the Kopetdag Mountains. Nohur local culture has been preserved due to its isolation from mainland Turkmenistan. Nohur is also a center of keteni(Turkmen silk) weaving, and this art is practiced by virtually every household up to today. Next to its cultural aspects, a visit to Nohur will also give an opportunity to enjoy magnificent mountain landscapes, canyons, waterfalls and highlands. Karakala is a small and pleasantly tree-lined mountain town in the heart of the Kopetdag Mountains, from where both the fertile river valleys as well as the lunar-like landscapes can be visited. Karakala has a botanical garden, is the base for wildlife protection activities, and in a nearby village is a museum dedicated to the famous Turkmen poet Magtymguly. 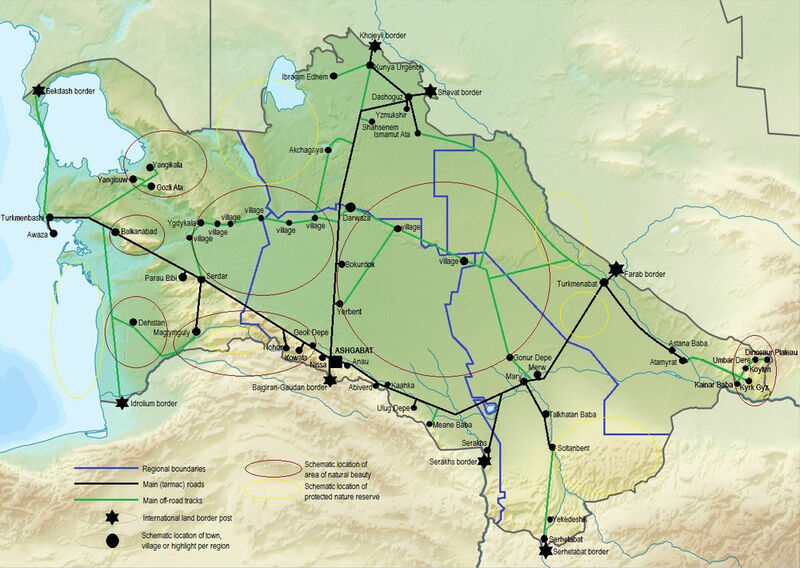 Karakala forms a good overnight location for westward travel from Ashgabat and Nohur to Dehistan and Balkanabad. The Karakum covers nearly 80% of Turkmenistan’s territory and is bordered by the Ustyurt Plateau, the Amu Darya and Murghab rivers, and the old Uzboy River and salt lakes near the Caspian Sea. 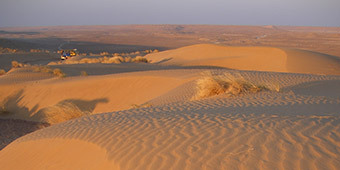 The desert landscapes include up to 35m high mounts of loose sand; broad, flat areas of fertile clay soil where desert acacia, poplar, white and black saksaul grow; and flat plains encrusted with salt. Herds of sheep and camels seek food and water om the fertile plains. Springtime is magnificent here. 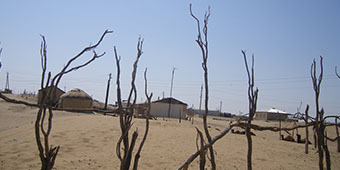 Erbent and Bokurdok, both surrounded by the sands of the Karakum, are villages inhabited by people of the Teke tribe. Various nomadic household and lifestyle aspects remain intact here. Easily accessible due to their location next to the Dashoguz-Ashgabat highway, a visit here gives you a glimpse into desert life. While having a cup of tea or chal (fermented camel’s milk), you can observe the yurt construction or watch the baking of Turkmen flat bread or the milking of camels. 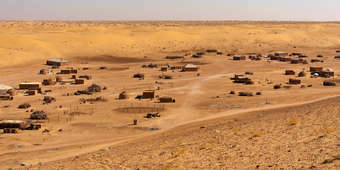 A cluster of authentic desert settlements, located in low basins in the heart of the central Karakum, accessible only by four-wheel drive, and requiring camp style overnight. Due to their remoteness and limited influence from modern urban development, hospitality, local traditions and nomadic lifestyle features continue to play a decisive role in these communities. While sleepy during the daytime heat, the villages come to life at sunrise and sunset. 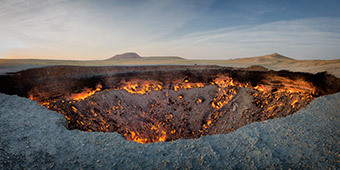 The center of a gas-rich area in the heart of the Karakum desert attracts travelers from all over the world because of its unique burning crater, that offers a particularly spectacular view in the dark. In the early seventies, an underground cavern filled with natural gas was identified here, remained unexploited, and therefore today looks like a large circular 60-m wide hole with hundreds of fires burning inside, some of them with flames up to 10-15 m high.